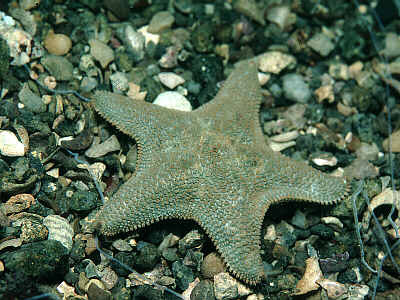 Description: A small flattened, cushion star, the dorsal surface is rough with projecting spines and most specimens are green in colour. There is often orange coloration along the margin of the arms. The dorsal surface is covered with groups of short spinelets, usually orange in colour. Up to 5cm. across. Habitat: A characteristic intertidal form commonly found under boulders or in crevices on rocky shores. Sometimes found in shallow water in sheltered localities. Distribution: Found on all western and southern coasts of the British Isles but not on North Sea coasts. Similar Species: Asterina phylactica is very similar but smaller and may be commoner sublittorally and in large rockpools. Cushion-star shaped with short arms. Short orange spines on back and around margins of arms. Picton, B.E. & Morrow, C.C. (2016). Asterina gibbosa (Pennant, 1777). [In] Encyclopedia of Marine Life of Britain and Ireland.